December 17 stands to be a key date for the teams competing to provide the next helicopter transport for the U.S. President. U.S. Navy officials appear to be sticking to their plans to announce the winner of the VXX competition for that aircraft on the anniversary of the Wright Brothers' first successful powered flight. 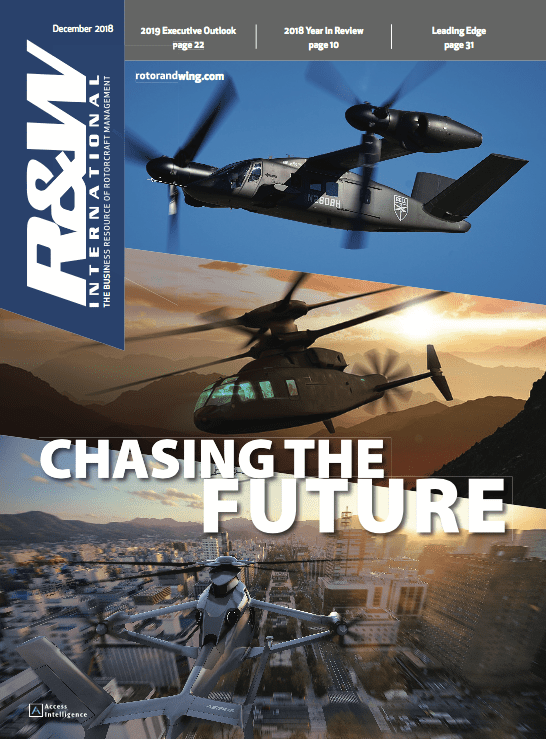 There were some similarities in the paths Sikorsky and the team led by Lockheed Martin and AgustaWestland chose to take to that milestone in the $2-billion program to supply 23 helicopters. Each team, for instance, played the political chess game, tearing a page from the playbook NASA used in the 1960s and 70s to build support in Congress for its manned spaceflight program. They each vow to spread subcontracting out among key states and congressional districts if they win. 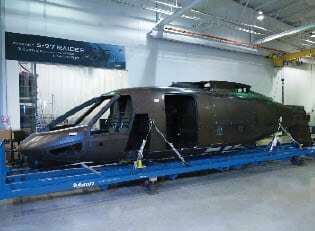 Sikorsky would parcel out VH-92 work among partners in California, Florida, Illinois, Massachusetts and Texas. According to the Lockheed Martin-led team, selection of the US101 would bring work to 200 companies in 41 states. It added an international twist, calling on key U.S. allies in the war in Iraq--U.K. Prime Minister Tony Blair and Italian Prime Minister Silvio Berlusconi--for support with the White House. Likewise, neither team has shied from attacking the other's aircraft. Fundamentally, though, the teams' approaches were distinctly different. The Lockheed Martin team focused on the technical aspects of its aircraft, saying the EH101's proven record in combat, its larger cabin, longer range and greater payload offered decisive advantage in securely transporting the President. Sikorsky tried to sell the American flag, arguing that only an all-American helicopter should be trusted with life of the President and the security of the nation. Sikorsky's approach made sense. For one thing, despite protestations about the need to honor fair and open competition, most key military acquisitions around the world are awarded to domestic manufacturers or foreign suppliers that cut the best deal for the domestic industry. For another, the United States is more jingoistic today than it has been in decades. It should come as no surprise, then, if Sikorsky wins VXX. The approach made sense for other reasons. Having, by necessity, maintained extremely close ties to the U.S. Marine Corps' HMX-1, Sikorsky figured its VH-3D would be good, reliable transports for the President into this century's second decade. That would have provided plenty of time to field the S-92 to commercial customers first, then to make modifications critical to the presidential transport mission--such as an upgraded engine and anti/de-icing capability. But that timetable changed on September 11th, 2001, after which additional equipment and mission requirements exhausted the VH-3D's performance margins. It's unheard of that a manufacturer that provides ongoing support to a key customer is surprised by the customer's new aircraft requirements, but that appears to be just what happened to Sikorsky here. Lastly, Sikorsky folks will concede the two VXX contenders are closely matched. (Lockheed Martin's people won't admit that publicly, but most observers agree. Public debate on the point is limited by the classifed nature of the competition's requirements.) That would seem to increase the likelihood that the decision on a contract winner could be politically influenced. Navair officials may argue the question is to be decided strictly based on the best technical solution to the President's secure transportation needs. But without a compelling technical argument for one aircraft or another, no Navy or Marine officer who aspires to flag rank will risk the wrath of an influential member of Congress who feels strongly about one aircraft or another. So selling the VH-92 as the all-American (and therefore) best answer to VXX through pricey advertising direct at the Washington, D.C. market--and thus turning up the political heat--must have seemed a good option. But the tactic backfired somewhat, drawing observers to recall the international genesis of the S-92, with partners in Brazil, China, Japan, Spain and Taiwan, and sparking a debate about domestic content of aircraft when almost every major aircraft program is international in nature. Lockheed Martin and its partners, meanwhile, march on, highlighting technical developments with their aircraft, such as the Royal Air Force's deployment of a Merlin (its version of the EH101) to Edwards AFB, Calif. on a C-17. Compatability with that aircraft is a VXX requirement, and while the Merlin required a special jacking rig to be fit into the Globemaster, it did fit. The EH101 also is now flying with higher-thrust GE T700 engines that have yet to be integrated into the S-92. 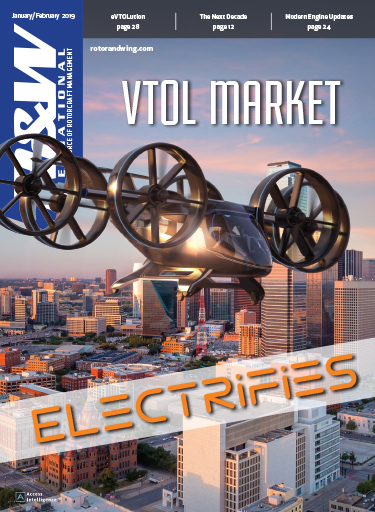 The public-relations battle in the U.S. military helicopter market is focused on the VXX competition to provide the next rotorcraft transport for the U.S. President. But the real money may lie in the U.S. Air Force's evolving competition for a new combat-search-and-rescue (CSAR) helicopter. The fight to replace the helicopters popularly known as Marine One involves the acquisition of about 23 aircraft. The Air Force competition involves roughly six times that number--with the prospect of many more sales to the U.S. and other nations. Drawn by such prospects, the VXX teams are pitching their contenders--based on the AgustaWestland EH101 and the Sikorsky S-92--for the Air Force's next-generation CSAR aircraft, dubbed the Personnel Recovery Vehicle. They are joined by a team of EADS and Northrop Grumman offering a version of the NH90 and the Bell-Boeing V-22 team. The USAF's CSAR fleet of 105 HH-60G Pave Hawks is more than 14 years old on average. The oldest are more than 23 years old and have flown for more than 7,000 hr. Acquired primarily to rescue downed air crewmembers, the Pave Hawks increasingly face mission requirements, such as insertion and extraction of special-operations forces, for which it is less and less suited. The Air Force is considering acquisition of 132 new PRVs to replace the Pave Hawks and expand the service's capabilities. Beyond the CSAR requirements, the Air Force is evaluating whether the time and technology is right to shift to a common-helicopter concept that also would result in replacement of its UH-1s, such as those flown by the 1st Helicopter Sqdn. at Andrews AFB outside Washington, D.C. During a national emergency, that unit is charged with protecting the U.S. congressional and executive-branch leaders in the line of succession to the presidency. 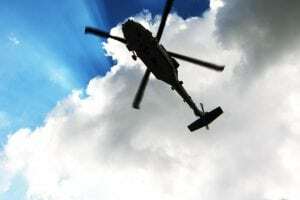 One study has projected the service could save more than $600 million by shifting to a common helicopter, USAF officials said. Development of one would be a first for the Air Force. Its current fleet is made up of modifications of aircraft developed for the U.S. Army. With the PRV, USAF officials said they want a helicopter that can carry a "full, standard-configuration load" over a straight-line unrefueled combat radius of 325 nm. The aircraft must be able to self-deploy worldwide (to a range of 4,000 nm.) and be mission ready within 24 hr. of notification. Alternately, it may be able to fit within a C-5 and or C-17 transport within 3 hr. of initial notification and be mission ready within 3 hr. of arrival at its destination. Initial funding for research and development of the PRV is slated to start this fiscal year. The Air Force aims to award a contract by the end of 2006, with first deliveries in Fiscal 2012 and an initial operational capability in fiscal 2014. AgustaWestland on Oct. 29 opened its expanded manufacturing facility in Philadelphia for production of A119 Koalas. 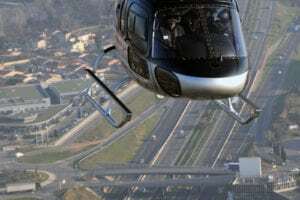 The company's U.S. subsidiary, Agusta Aerospace Corp., will build all A119s for civilian and law enforcement customers throughout the Americas at the site. The single-engine light utility A119 Koala used by state police agencies, Emergency Medical Services and offshore companies across the United States. On display at the ceremony was an A119 in the livery of the New York Police Department. That is the third A119 for the NYPD, which is operating two and has a fourth in production. The $6.8-million expansion of the Philadelphia facility provides a state-of-the-art, 40,000-sq.-ft. workspace that includes flight hangars, completion and final assembly areas, manufacturing stations and avionics assembly. The expansion will allow AgustaWestland to boost employment at the plant by 50 percent. "Philadelphia is a key element of AgustaWestland's expansion, which enables us to build helicopters that meet the needs of American customers and are manufactured by an American workforce in collaboration with other American companies," said Pier Francesco Guarguaglini, Chairman and CEO of Finmeccanica. "Today's event confirms that AgustaWestland is a global player in the helicopter industry, both internationally and in the United States," said Amedeo Caporaletti, CEO of AgustaWestland. Giuseppe Orsi, CEO of Agusta SpA, added that "AgustaWestland is proud of its longstanding commitment to bringing continued investment, cutting-edge technology and high-skill manufacturing jobs to the United States with both our A119 and US101 helicopter." The opening was welcomed by local politicians, including Rep. Curt Weldon (R-Pa.), who chairs the Tactical Air and Land subcommittee of the Armed Services Committee in the U.S. House of Representatives, and one of Pennsylvania's U.S. senators, Republican Arlen Specter, who had trouble pronouncing the name of the helicopter maker, calling it "Augusta." "AgustaWestland's increased investment in its Philadelphia home is further evidence that Pennsylvania continues to be an attractive place for global companies to do business," said Specter. "This expansion will mean more good, family-supporting manufacturing jobs here in Philadelphia." Canada's Federal Court has added to the saga of that nation's protracted Maritime Helicopter Program by putting off a ruling on an appeal of the National Defence ministry's selection of the H-92 Superhawk variant of Sikorsky's S-92 as its new multi-role rotorcraft. Canada picked the H-92 July 23 to replace its aging and problem-plagued Sea Kings. The award, valued at $3 billion, involves two contracts. The first would cover the acquisition of 28 fully integrated, certified and qualified helicopters with mission systems installed and modifications of 12 Halifax-class frigates to handle the aircraft. The second contract would be for a 20-year in-service support contract. But AgustaWestland, whose Team Cormorant offering of the EH101 lost the bid, filed an appeal with the Federal Court. It argued that Sikorsky consistently received favorable treatment in the procurement process. Team Cormorant included Bell Helicopter Textron, Boeing and Canada's CAE. The court set an Oct. 26 hearing on AgustaWestland's appeal of the award, but that hearing was postponed. The Canadian government has said it will not sign a formal contract with Sikorsky until the Federal Court rules on the appeal. The delay is the latest in Canada's drawn out effort to acquire replacements for its Sea Kings. It picked the EH101 for that role in 1992 under the Maritime Helicopter Program, but the national government changed hands the next year and the new prime minister, Jean Chretien, cancelled the acquisition. In 1998, Canada finally proceeded with acquisition of the EH101s and today it operates 15 of those aircraft, dubbed Cormorants, for search-and-rescue missions. The Maritime Helicopter Program was revived two years ago. In the interim, reliability and performance problems with the Sea King fleet have worsened, making the aircraft subjects of public ridicule and aviators' concerns. If the H-92s ever enters service with Canadian forces, they will be called Cyclones. Bell Helicopter Textron is offering the Bell 407 and Bell 210 helicopters for the U.S. Army's Armed Reconnaissance Helicopter and Light Utility Helicopter programs, respectively. The ARH would be a replacement for the OH-58D Kiowa Warriors, an aging airframe that goes back to the 1960's Vietnam era. The 210, an updated version of the venerable UH-1 Huey, would serve in the LUH role for non-combat role such as homeland security. The Army has already issued to the industry a draft request for proposals for the armed reconnaissance program and was to brief it to the Nov. 18 Joint Requirements Oversight Council review. Proposals are due back to the Army by the end of the year. Alan Moffatt, Bell's ARH program director, argued at the Assn. of the U.S. Army annual conference in Washington, DC in October that Bell has four unique capabilities suited to the program requirements, those being an exceptional aircraft, system integration capability, a high-rate manufacturing capacity and a worldwide customer support program. The 407 can be outfitted with a variety of weapon systems, to include 7.62mm rocket pods, Hellfire missiles and the Joint Common Missile. "It is a real good street fighter," Moffatt said, with crashworthy fuel cells and survivability equipment, plus armor protection available both for the crew and engines. Maintenance is less than 1.5 maintenance man-hours per flight hour, he said. Bell said 605 Bell 407s have been built for customers in more than 41 nations and the aircraft was recently demonstrated to military customers in India and Nepal. The aircraft surpassed the 1.17 million-flight hr. point as of Oct. 1, with two aircraft each exceeding the 10,000-hr. mark, since gaining FAA certification in February 1996. Moffatt noted that two 407s can be fitted into a C-130, flown to their destination and readied to go into combat within 15 min. of being off loaded. It is also interoperable with maritime-qualified 407s supporting Navy ships. The Bell 210s that are being offered for the LUH program would be UH-1s retired from the Army's inventory and converted to the newer version. Cost would be $2.95 million per aircraft at an eight-month conversion rate, according to Dave Keating, Bell's head of Army business development. The rebuilt aircraft would have an upgraded engine, new electrical system and dual boost hydraulics. It would be aimed at missions such as homeland defense, search and rescue, and medical evacuation and disaster relief. Keating said that the 210, "Is the easiest and simplest solution for the Army to get 322 LUHs in the field that can fit into the existing Army infrastructure." Bell is also aiming the 210 at the civil market and expects FAA certification by the end of January. First flight of the aircraft is expected this month. Northrop Grumman said it can deliver a preliminary version of the FireScout rotorcraft UAV to the U.S. Army in Fiscal 2006, ahead of its plans to deliver the UAV in the Class IV configuration scheduled for the Army's Future Combat Systems modernization program. Essential it is a Navy-configured FireScout modified to meet the Army's requirement of a One System ground control station. The future FCS Army FireScout would have a modified data link, a different command and control system and different sensors. While the early version of the FireScout would not have the technology being developed for the Future Combat Systems version of the FireScout, it would have fire power capability and the potential for communications relays, said Nicholas Yorio, director of tactical intelligence, reconnaissance and surveillance. At a AUSA press conference, Yorio said that early FireScouts delivered to the Army would have a similar layout to the type being developed for the U.S. Navy. The Army's version would be paired with the Army's One System ground control station, which handles the controls for other UAVs, such as the AAI Shadow. Northrop Grumman has also proposed an upgraded version of the fourth-generation Heron medium-altitude long-endurance UAV for the Army's new extended range/multi-purpose UAV System. The new UAV, designated the Hunter 2, will provide corps commanders with consistent intelligence, surveillance and reconnaissance, and communications relay, as well as weapons capability. Yorio said that the Hunter 2 system "combines the reliability and performance of proven, existing UAV systems with low-risk technology improvements to achieve a best-value solution for today's and future soldiers." The Hunter 2 would combine the performance of the Heron UAV with advanced technology subsystems and system architectures from other Northrop Grumman UAV programs, building on the legacy of the company's RQ-5 Hunter. The company noted that the RQ-5 has logged more than 32,000 flight hours, of which 13,000 have been in combat operations in the Balkans and Iraq. For the Hunter 2 program, Northrop Grumman's Integrated Systems Sector would serve as prime contractor, supported by the company's Electronic Systems Sector for inertial navigation subsystems, the Mission Systems Sector for Army C4I/IER and mission planning, and its Space Technology Sector that will develop and integrate communications systems. Other members of the team include Aurora Flight Sciences of Manassas, Va., which will provide the vehicle design support and manufacture the air vehicles at its Starkville, Miss. facility; CAS Inc. of Huntsville, Ala., for client-based knowledge of weapons, integration, performance-based logistics, and engineering test and evaluation; and Cubic Defense Applications in San Diego, for advanced interoperable data links. Yorio said the Hunter 2 features advanced technology subsystems with redundant avionics and flight-control architecture to ensure high levels of autonomy, navigation accuracy and reliability. Bill McCall, ER/MP program director, said that the Hunter 2 was designed with the enlisted soldier in mind. "We've taken the best features of the MQ-5B Hunter, the RQ-5 Hunter and the Shadow ground system and married them with the next generation Hunter air vehicle, mission planning, C4I capability and interoperable data links. It will provide land commanders with real-time, actionable intelligence. When combined with a planned weapons capability, this intelligence will help enable a system that minimizes development costs, reduces support costs and ultimately total ownership costs with enlisted soldier proven training and logistics support." 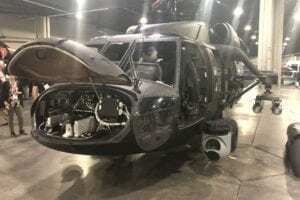 The California Army National Guard demonstrated its new Sikorsky UH-60L Firehawk helicopter in October, months ahead of a planned demonstration scheduled for mid-2005. The demonstration was pushed up after the aircraft was pressed into service to fight current California wildfires. The aircraft was delivered several months ago and "was put into action as soon as it was delivered to take part in this year's busy fire season," said Lt. Jonathan Shiroma of the California National Guard. The demonstration was held for representatives of the National Guard, the Governor's Office of Emergency Services and the California Department of Forestry and Fire Protection. Five states currently have Firehawk helicopters operated by their Army National Guard units. The other four are Florida, Nevada, New York and Oregon. The Army National Guard's aircraft are fitted with a removable 1,000-gal. water tank for firefighting. It also carries 30 gal. of fire suppressant mix. It can fill the water tanks from trucks, pools or other bodies of water in 60 sec., and also carry crews, fuel and equipment to support the operation. Two high-tech companies, Sky Connect and Innovative Engineering, have merged the capabilities of their complementary technologies to enhance flight planning and flight following for emergency medical service flight operations. The technological merging unites the capabilities of Sky Connect's Tracker with Innovative Engineering's AeroMap technology. Tracker uses the reliability of the global Iridium satellite network to provide position reports and voice communications, while AeroMap software enables operators to develop detailed flight plans, according to Wiley Loughran, senior vice president, sales and marketing for Sky Connect. Tracker automatically sends position and flight status reports via satellite to the AeroMap server. AeroMap then formats the data, creating a permanent log of the flight and displays it graphically on all authorized monitors. The actual flight path is overlaid on top of the flight plan, making it obvious if an aircraft deviates from its course. JSSI, a provider of hourly cost maintenance guarantee programs, has launched a e-commerce web portal platform to provide clients and vendors "faster, easier and more efficient" service, the Chicago-based company said. JSSI provides independent, customized hourly cost guarantee programs for both fixed-and rotary-wing, turbine-powered aircraft under a series of financial programs designed for an operator's maintenance financial requirements. The new web portal--MyJSSI.com--"allows customers and vendors to perform all key commercial transactions online, such as billing, flight-hour submission, invoicing and payment tracking. The technology is estimated to increase productivity by five to 10 times," said COO Edward Hawkins. MyJSSI.com is "truly a full-service e-commerce portal," he said. It is designed to allow round-the-clock access to key business documents and transactions for customers and vendors. "MyJSSI.com adds significant value and convenience to the services we currently provide," Hawkins said. "One of the most exciting aspects of MyJSSI.com is that for the first time, we are able to give customers and maintenance facilities access to all the commercial transactions they are doing with JSSI." He said this gives everyone involved in a transaction a full picture of both sides of the deal. Customers can see the amount of expense they will incur for any shop visit that relates to the service on their aircraft. "This will make our clients annual budgeting process much more effective." Customers can also ask specific questions through the web site, with a response from the appropriate JSSI expert promised within 24 hr., he said. JSSI provides a range of six programs aimed at the various requirements for engine, airframe and avionics maintenance financial support. Vanderbilt LifeFlight took delivery of the first of three recently ordered Eurocopter EC145s during the Air Medical Transport Conference in October. The three helicopters will replace four Eurocopter BK117s currently operated by Vanderbilt LifeFlight. The aeromedical transport service is based at Tennessee's Vanderbilt University Medical Center and provides services in Tennessee, Kentucky and Alabama, with helicopters based Lebanon and Shelbyville, Ky., and Clarksville and Mt. Pleasant, Tenn.
Jeanne Yeatman, Vanderbilt LifeFlight program director, said that the EC145's longer range "will allow LifeFlight to increase the number of communities it serves, and the helicopter will provide the medical crews with increased payloads and clinical space." Based on the service's experience with the BK117s,"the selection of the EC145 was a natural progression to enhance our capabilities." The new EC145s will give the LifeFlight unit the ability "to fly safer, longer and faster while integrating the enhanced state of the art medical configuration developed by Metro Aviation," she said. Simplex Manufacturing Company has received certification from the European Aviation Safety Agency for the Simplex Model 310 line of Fire Attack Systems designed for use on Eurocopter AS350-series helicopters. Approval was granted for the system to be placed in the 900, 1100 and 1200-liter capacities. EASA approval followed certification by both the French and Spanish civil aviation authorities. 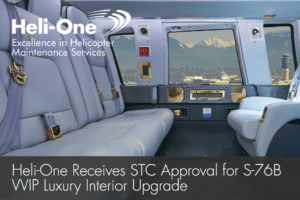 The approval for the AS350 system is the second EASA approval for a Simplex product and the first of the company's Fire Attack Systems, according to Simplex President Steven Daniels. Simplex Manufacturing Company is a Portland, Ore.-based company providing helicopter application systems for airborne firefighting, agricultural application spraying, oil spill response and Class A & B foam concentrates. U.S. Army aviation and special operations forces aviation commanders are closely collaborating to improve their capabilities, according to a report from the Assn. 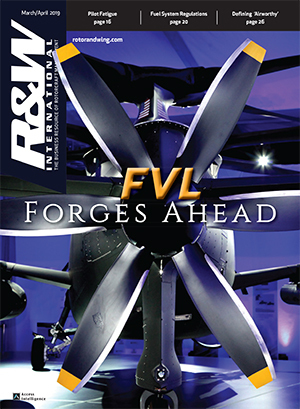 of the U.S. Army by Defense Daily, a sister publication of Rotor & Wing. "What we are doing, through each of our PMs (project managers), is working a coalition if you will, with the special operation organizations to ensure that those capabilities that they employ are evaluated and then we're looking to bring them into the force at large," said Paul Bogosian, program executive officer for aviation. The Army leadership made the task of forging tighter links between the two communities to develop equipment, exchange techniques and leverage technology a priority. The Army chief of staff, Gen. Peter Schoomaker, mentioned it several times, initially in his July 2003 confirmation hearing. Then, only months later as chief of staff, he made leveraging special ops forces aviation for the conventional force a specific task within the aviation task force that was focused on aviation transformation. "Certainly that desire is more pronounced, I think now, because the expectation of the leadership and the model being adapted by the acquisition community at large is that we will take technology as it's available and we will take that technology into the force so that has application in the near term," Bogosian said. The Special Operations Aviation Regiment is somewhat of a laboratory, though it is not a traditional development organization, he said. "But what they're very good at doing is responding to requirements and bringing technology forward, getting it into the field very quickly and using it for operational effectiveness." There are a number of specific instances where they have led some technology initiatives that are cascading to the conventional force. "There have been some technologies associated with IR [infrared] suppression associated with engines that they're doing some great work in and we're bringing that forward, and then there are a number of other areas in the survivability arena where the special operations forces have made some real improvements." 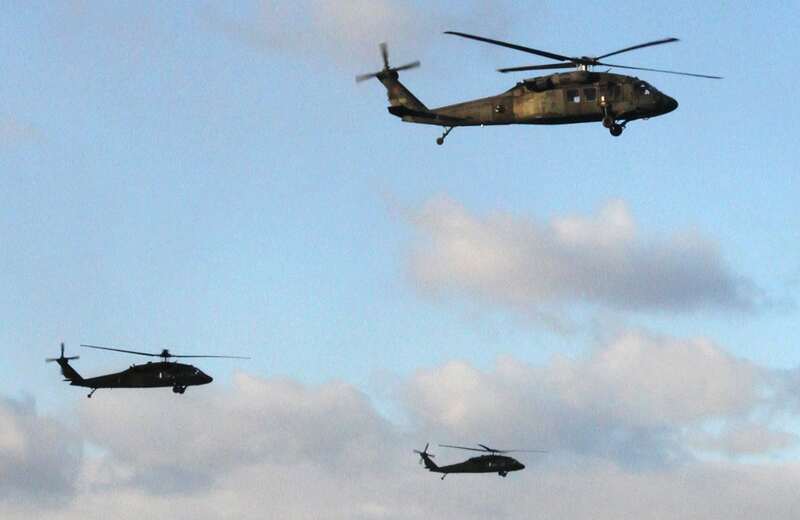 Col. Cory Mahanna, the Army's utility helicopter project manager, said that it is a cross-fertilization process now. "Every 90 days Team Utility travels up to and sits down with the SOF community or the SOF community travels down and sits down with us." Technologies are transferring both ways, he said. "Specifically, the ballistic blankets that we're putting on and have on the [UH-60M] originated with the special ops and we're reusing their kits with some adaptations for us." Transferring the other way are composite tail booms on the M model fleet as part of the upgrade program. "We're doing that and we're transferring those to the SOF community. I'm actually qualifying the tail boom at 23,500 lb., which is the higher gross weight for them." Additionally, the fly-by-wire programs for the MH- and UH-60M fleet are co-funded. "One of the reasons why we do that is it lightens the airplane, we take 400 components off the aircraft, there's no more rigging. It's just an elegant solution," Mahanna said. Bogosian said there is a similar arrangement on the Boeing CH-47. "One of our remanufacturing programs is taking a cargo aircraft to a CH-47F model. Likewise, the special operations community is going to a MH-47G. [This is similar to how] we start with a common air vehicle, then the special operations equipment, which is unique for the operation purpose that they have, is modified off the same essential airplane." Lockheed Martin reports that it has now flown a company-owned US101 with new General Electric CT7-8E engines. The EH101 is powered by three Rolls-Royce Turbomeca RTM 322 engines in the Royal Navy and RAF versions, the GE T700 in the Italian navy variant and the T6A1 in the Canadian Cormorant version. Steve Ramsey, US101 vice president and general manager, said that the CT7 powered aircraft "is actually owned by the Team US101, so it's not an operating Royal Air Force EH101." Previous demonstrations had already taken place, but with operational British assets, he said. "We have named it the `first' US101 helicopter." Lockheed Martin also announced that as part of its "built in the USA" program for the US101, it has added 20 U.S. companies to its list of vendors for production of the VXX version of the EH101 should it be chosen as the next U.S. presidential helicopter. All 20 companies are in the three states of Delaware, New Jersey and Pennsylvania. Lockheed Martin has already chosen five companies located near Johnstown, Pa. for the program. Pennsylvania companies include: Alcoa, Inc.; Eaton Aerospace; Lord Corp.; PennEngineering Fastening Technologies; PPG Industries; Souriau USA, Inc.; Spectrum Control; SPS Technologies; Triumph Controls, Inc.; and TYCO Electronics. New Jersey companies are: Avionic Instruments, Inc.; BAE Systems; ITT; Kulite Semiconductor Products, Inc.; L-3 Communications Systems; Saint-Gobain (Norton Performance Plastics); Summit Aviation Supply; and Technik, Inc. Delaware companies are: Dupont DOW Elastomers LLC and W.L. Gore & Associates, Inc.
Lockheed Martin said that has now chosen more than 200 companies in 41 states to support the US101 program, and that during the life of the helicopter fleet's operational service live, 90 percent of the total life cycle costs will be to its U.S. suppliers. Omniflight Helicopters of Dallas, Texas and Mesa, Ariz.-based Native American Air Ambulance (Native Air) merged their operations in October, creating what executives of the new company said is one of the largest and best financed full-service air medical companies in the United States. "By merging the two companies, we are able to offer our customers a comprehensive service model to support our hospital customers and our community partnership programs," said Jim Weaver, newly appointed president of Native Air. The two companies will retain their own identity and corporate structure, although Weaver reports to Mark Johnson, CEO of Omniflight. The merger combines the 11 rotary- and five fixed-wing aircraft of Native Air with Omniflight's 44 helicopters. Omniflight had been providing helicopter service to Native Air for the past seven years and was purchased by a group of investors in May 2003. Included in the investors group was Johnson, the Omniflight CEO. "The merger of these two organizations was the next logical step in our plans to broaden the product offering for Omniflight and its customers," Johnson said. "The combination of these two companies creates a very powerful force in the marketplace today," he said. "Our company was one of the best capitalized companies in the industry and now is even stronger" due to investments by Texas Growth Fund and Blue Sage Capital. "We are well positioned to aggressively expand with our existing hospital customers as well as develop additional geographic relationships under the independent provider model." 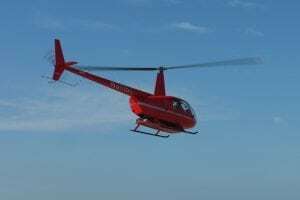 The HAI has responded to an Interim Final Rule issued by the U.S. Transportation Security Administration that will severely impact on helicopter flight training. Stating that the ruling will have "a significantly negative impact on flight schools throughout the United States," HAI listed five distinct oppositions to the rule. The rule, which took effect Sept. 20, is aimed at screening out potential terrorists using flight training to target U.S. institutions. In a letter to the TSA, HAI President Roy Resavage said the rule is all-inclusive for flight training, "encompassing an extremely diverse industry," placing the same requirements on all flight schools and instructors regardless of the type or category of aircraft that is being used. According to the rule, any flight instructor in any type aircraft will be "required to go through extensive security training, screen potential flight students and maintain records for long periods of time, all at his or her own expense." The new rule will also preclude foreign operators from having the flexibility they need to schedule pilots to attend U.S. flight school, Resavage said. While TSA "may believe that it is the responsibility of the foreign operators to plan ahead and organize the required information well in advance, such logic fails to recognize that flight operations do not always neatly follow a set of preset guidelines." There is also concern about the perception that the United States holds toward foreign students, he said. "No flight student wants to be needlessly treated as a suspected terrorist," he said. With the security measures already established to prevent terrorist acts, "HAI questions the efficacy of the additional security measures this new interim rule will provide in the U.S."
The new rule will lead to "confusion and loss of business" because of the extremely short timeframe given flight schools to implement it, Resavage said. "With increased participation and input from the flight training industry, a more practical new rule could be established that would achieve the goals mandated by the Congress." As his last opposition to the interim rule, Resavage said that despite TSA assurance that the rule will not be aimed at the domestic flight training market, "it would be naï¶¥ to assume that would be the case." The economic burden has not been thoroughly vetted and the consequences for small flight schools and individual flight instructors will be staggering, he said. "The current personnel at the TSA will change over time, and verbal promises made today regarding the intent of this rule will have little influence on future decisions that can arise from some of the confusing language" in the rule." Bell Helicopter customers will be able to better manage operational costs under a new "Fly Smart" member program introduced by the manufacturer. The program allows fixed prices for various components, beginning with parts costs, according to Carey Bond, vice president of customer service and product support. The new program will let operators plan their parts expenditures months, and even years, in advance, he said. The program is based on an operator's flight hours, allowing the individual user to budget according to specific business and flight requirements. "I am extremely pleased to introduce this program for our customers," Bond said. "Fly Smart members will now be able to tailor their parts plan to their flying program. It is no longer a `one size fits all' plan, but a cost effective way for operators to manage the parts and repairs portion of their business. He said the program is the first phase of several customer support and service plans that will provide the absolute best value for our customers." Future programs planned under "Fly Smart" include training, engine support and possibly reduced rates on insurance policies. The program was introduced by Bell at the recent Air Medical Transport Conference in Cincinnati. National Business Aviation Assn. has hired aviation lobbyist Lisa Piccione as its new senior vice president, government affairs. Prior to joining NBAA, Piccione served as a senior lobbyist for Delta Air Lines and the Airports Council International-North America. Piccione replaces Pete West who joined NBAA in 1987, became senior vice president, government affairs in 1998 and announced his retirement effective Nov. 1. NBAA has also hired Dan Hubbard to be vice president, communications effective Dec. 1. Prior to joining NBAA, Hubbard served as vice president for Fleishman-Hillard, a leading international public relations firm. He has also worked for Sens. Christopher Bond (R-Mo.) and John Ashcroft (R-Mo. ), the current U.S. Attorney General. Two NBAA staff members were promoted during the recent flurry of staff changes. David W. Almy has been promoted to senior vice president, marketing and communications while Kathleen M. Blouin has been promoted to senior vice president, conventions and seminars. The changes reflected the recent retirements of Joe Ponte, vice president, membership, marketing and regional programs. Almy has been with NBAA since 1993 and most recently served as vice president, strategic programs. Bloun joined the organization in 1992 and has been a major factor in the success of it conventions, seminars and forums, as well as directing the launching of the European and Latin American Business Aviation Convention & Exhibitions (EBACE and LABACE), NBAA said. Feb. 6-8--Heli-Expo 2005, Anaheim, Calif. Contact Marilyn McKinnis, the Helicopter Assn. International, Alexandria, Virginia, at 703-683-4646; fax 703-683-4745; web www.heliexpo.com; e-mail: marilyn.mckinnis@rotor.com. March 22-24--Navy League Sea-Air-Space Expo, Marriott Wardman Park Hotel, Washington, D.C. Contact: J. Spargo & Assoc., 703-449-6418; fax 703-631-7258; web: www.navyleague.org; e-mail: sasregistration@jspargo.com. June 13-19--46th International Salon of the Paris Air Show (2005), Le Bourget Airport, France. Contact: Salons Internationaux de l'Aeronautique et de l'Espace, Paris, France, +33-(1)-53-23-33-33; fax +33-(1) 47-20-00-86; web www.paris-air-show.com; e-mail: info@hfusa.com; or siae@salon-du-bourget.fr.